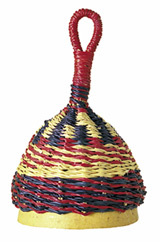 Colourful, easy to hold and made from very strong natural materials, the Basket Rattle is popular with children and adults alike. A best selling hand percussion instrument that looks and sounds great! The basket rattle or caxixi is made from a basket with a gourd sealing the end, and is filled with seeds. How to play the caxixi: Hold the caxixi or basket rattle in one hand and shake up and down, or tap against the palm of your other hand to produce a beat.